Let's go get our friend Jamie. Isn't she sooo cute. It was a great day for the park. Jamie is 9 (almost 10) and my daughter is 23. I get to go spend time with Jamie once a week during the school year and during the summer we try and get together for games, swimming, eating out, we have even been known to do some cooking. Kayla goes along with me whenever she can and Jamie has really grown close to her. I just love how they are looking at each other in this picture.....friends having fun. Jamie wanted to go on ALL the toys. This is why Jamie loves her coming along, she gets a kid to play with. Every once in a while I made her stop long enough for a picture. Playing is such hard work. Good friends....... making some Great memories. I know...here I go again, but what can I say, I don't want to stop now... I'm on a roll. Anyway this is what I used to label my baskets. The left is zip ties and the right is "badge" holders. I got these at my favorite boutique...Walmart (for those of you who don't live around here, it is a all in one shopping center). They were cheap, and all that ya need to do is print out your labels on card stock, cut and put in the plastic badge holders. The great thing is you can wipe them off and change them anytime you change what is in the basket. 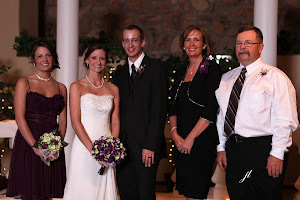 I have LOTS of family pictures and can't always put them all out at once, so I rotate them. This made it super easy to find them. I bet your getting the idea by now and maybe getting sick (no pun intended here) of my ideas. 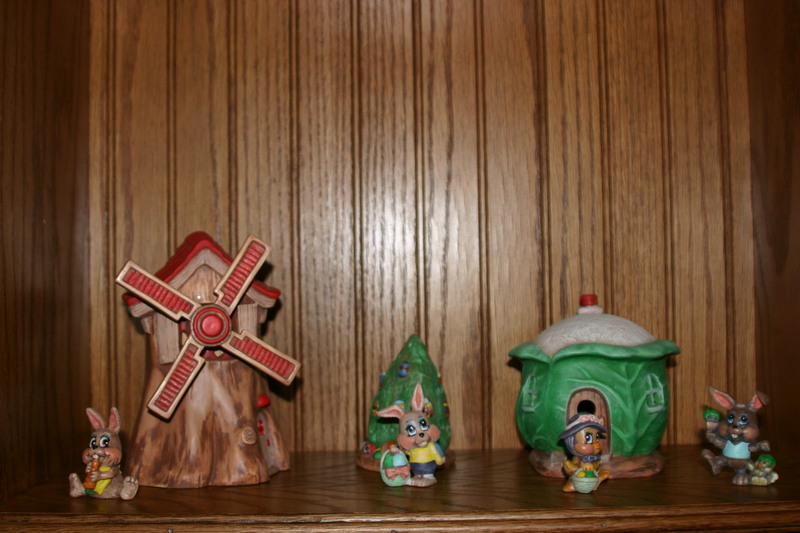 This is some of my ceramics I have painted in years past....This is my "Easter Village", complete with a cabbage home and Easter Tree. I don't have all my village pictured here, there is also an Easter Egg house and a carrot house. I love decorating for holidays. These are my ducks. I would have shown you more ceramics I've painted, but I didn't even get around to putting out any of my Easter this year, these are pictures I took last year.....talk about lazy. 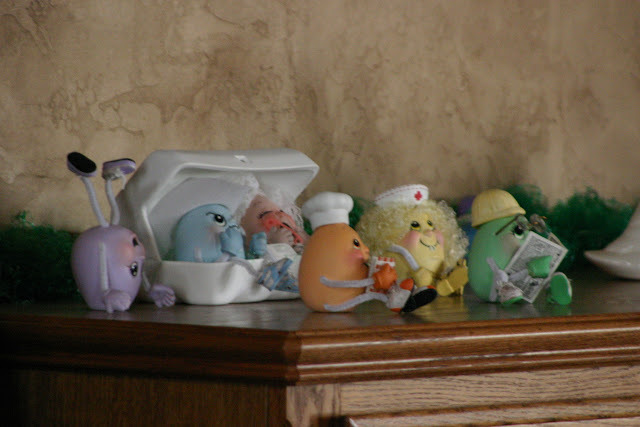 These are part of my ceramic Easter eggs. One is on his head, a baker, a nurse, a construction worker reading his newspaper, a cowboy and a baby crying. I have more of these, but only got a picture of the six. Oh, how I use to love to paint my ceramics. 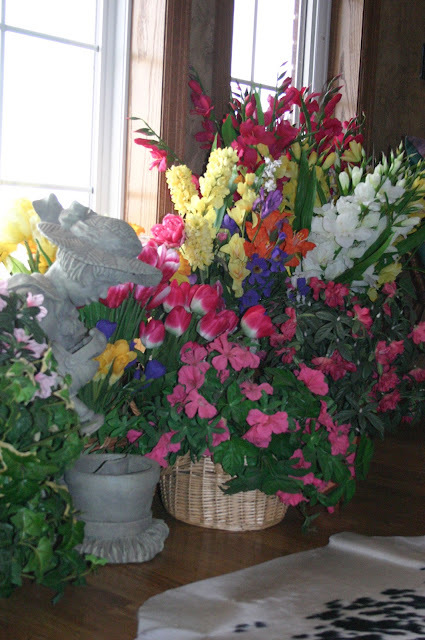 it makes me feel like springtime is just around the corner, seeing all of the colors. 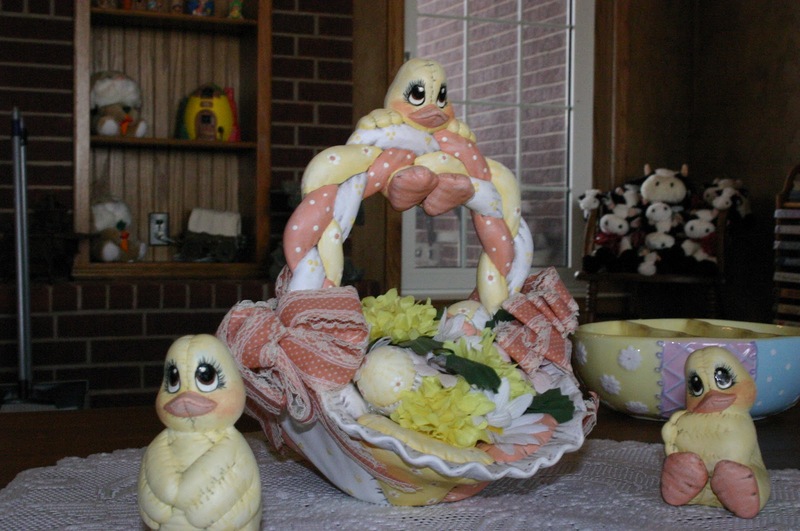 But of all of my "Easter" decorations this one just might be my favorite. I have it up all year so it isn't really my "Easter" decoration, but it speaks volumes without saying a word.